historical event: He announced that he is fighting against feminism and shot all nine students in the classroom, 6 of which died. Then he came out into the hallway and continued to shoot, targeting women. He shot 28 people in total. All 14 women killed were younger than 32 years. 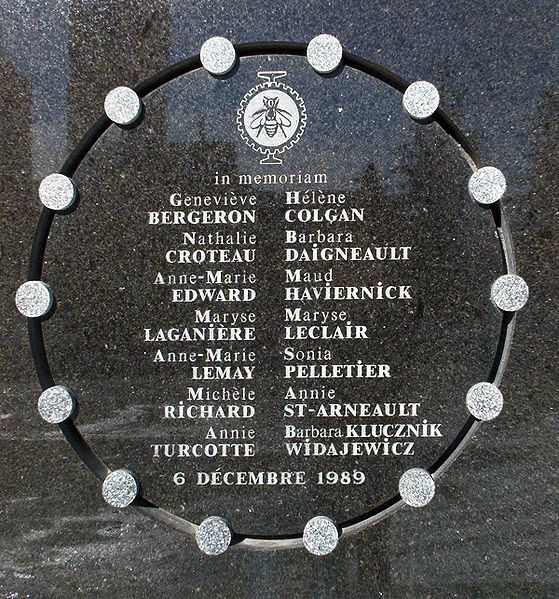 On this day, a 25-year-old Canadian of Algerian origin shot 28 people before taking his own life. His born name was Gamil Rodrigue Liass Gharbi, but he later changed it to Marc Lépine, giving his hatred of his father as the reason. It seems that his father was an abuser and despiser of women. On this day, Marc Lépine came to the Montreal Polytechnic School (Ecole Polytechnique) with his legally procured semi-automatic rifle. He walked into a classroom and ordered the separation of male and female students. He announced that he is fighting against feminism and shot all nine female students in the classroom, six of whom died. Then he came out into the hallway and continued to shoot, targeting women. In total, he shot 24 women and 4 men, killing 14 women, all of whom were 32 or younger. In the message that he left behind, he argued that feminists had ruined his life. There is still no unambiguous explanation as to what prompted him to this act, but theories include the assumption that he was a victim of child abuse.